Fired to 1900 F with heavy post firing reduction using newspaper. No burping. The flashing will vary with each firing. This was fired to 1875F and given medium post-firing reduction using newspaper after pulling from the kiln. The flashing will vary with each firing. Both of these were fired to 1875F and given medium post-firing reduction using newspaper after pulling from the kiln. 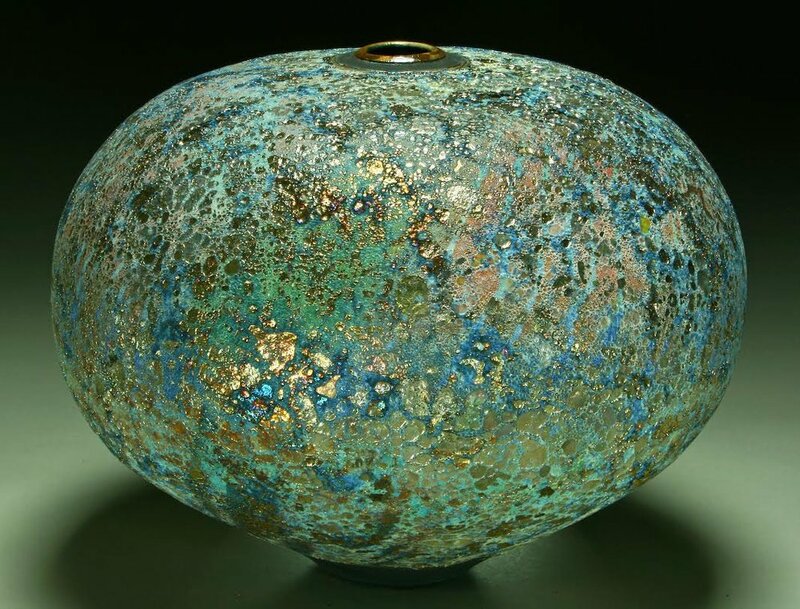 The raku glaze of the month is a greenish blue with copper flashes that will vary from firing to firing. The Naples Ikebana Chapter is one of the larger chapters in the U.S. with about 70+ members. I have fired these raku ikebana pieces using special glazes that coordinate well with the natural vibrancy of various flowers. These special raku pottery pieces embody this wonderful art form and are sure to give an extra bit of life to any floral arrangement. Midnight Blue is a rich cobalt blue with red streaks in post firing reduction. Stay tuned for this month's pot which features previous glazes of the month: Blue Moon, Lime Green and Sassy Fat White/Silver Slither, in addition to this month's Midnight Blue. Raku pottery is an ancient Japanese art form that requires a meticulous process. But the final step is pure chance, and for Steven Forbes-deSoule, that’s the joy. “It’s like being a kid at Christmas,” he says. Pieces are rapidly heated in a small kiln to the optimal temperature of 1900-2000 degrees Fahrenheit. Then they’re removed and placed in a metal can with newspaper. “The paper catches fire immediately, and, after a few seconds, a lid is placed on the can extinguishing the flames and creating an oxygen-starved environment,” the potter explains. This method produces a variety of effects on the piece, and it’s never the same look twice. Cowee Pottery School is a nonprofit organization located in the historic Cowee School Arts and Heritage Center in the mountains of beautiful Franklin, North Carolina. We are run by a group of dedicated volunteers who specialize in teaching people of all ages the enriching art of pottery. We offer affordable month long classes, perfect for the beginner or the pro. To see our current class list, click the button below. We keep the pottery studio open frequently throughout the week. Anyone enrolled in one of our classes can join us to practice and perfect their pottery skills during open studio at no extra charge. Day and times of open studio are listed. Cowee Pottery School is here to serve those who have always wanted to get their hands muddy and create pottery, to play in clay. Which is why we're excited to host a range of pottery classes for the community. Difficulty level ranges from introductory to experienced, however most all classes will have a beginner aspect to them. And of course, all classes cater to the curious. With Silver Nitrate added I call this glaze Silver Slither, which is pictured. This glaze has to be fired hot to about 1950F for the platelets to form beads. it looks different on top of a variety of base glazes as you can see from the photos. Works best on shoulder of pieces or on a more horizontal surface. Mix on the thick side. I usually apply a very small amount at a time by either pouring or brushing. When I pour it, I often will blow on it to move it around. Lime Green Crackle glaze is fired to 1900 degrees F, pulled from the kiln and reduced in a small can with newspaper. This month's glaze is a revision of my March Glaze called Lime Green Crackle. Stay tuned for a silver glaze recipe next month! This glaze is fired to 1900 degrees F, pulled from the kiln and reduced in a small can with newspaper. Lid is put on immediately. Wait about 2 1/2 minutes and remove the lid. Rub the top of pot with torn newspaper using gloves. Once paper ignites cover can again immediately and let cool (you may have to use a torch to reignite the paper). As shown fired to 2000F with pyrometer so the silver glaze will melt. A note about Hectorite: It's a suspender in powder form similar to Bentonite except it doesn't have to be dry mixed with the other chemicals. It's not a common raku pottery glaze chemical and you may have to search for it on the web. I purchased mine at Highwater Clays, but they don't carry it anymore due to lack of demand (nobody knew what it was used for). Pot of the Month | Enjoy 20% off! Starting this February 13th, 2018 I will be adding a "Pot of the Month" every month. Enjoy 20% off as supplies last with coupon code: POTOFTHEMONTH at checkout. If you sign up below you will receive information regarding a new raku pottery piece each month before it is uploaded to my website or posted on social media. Sign up to be the first to know about my "Pot of the Month" before it is posted on my website or social media. This is a stable blue and red glaze. 1/2% Epsom Salts can be substituted for Bentonite. This glaze produces some incredible raku pottery and is one that I developed several years ago. This picture is the results of the raku glaze fired to 1900F. It remains a staple in my studio. See more of my work by visiting my raku pottery store. To learn more about my process, visit my raku firing page. I just completed firing 25 pieces for a new commission from Art and Associates in Atlanta, Georgia. It will be installed in the new DCCU headquarters in Atlanta. This bottle is one of the pieces which features my Space Rock glaze. Please note that our Fairs are moving from 4 days to 3 days, and we look forward to welcoming you on Friday. I will be hosting a Raku Workshop in Highlands, NC at The Bascom's Dave Drake Studio Barn entitled "Fire and Smoke, the Art of Raku" from June 26-30, 2017.